Saving as a PDF file means that a file should print as close as possible to how you see it on your computer, with all the right fonts and layout. Extensive instructions can be found here. Anything that is printed up to the edge of the paper is (usually) printed slightly larger with a bleed around the edge of the artwork. The bleed is an extra bit around the edges that is trimmed off after printing, so if you want a background colour or photo, or maybe lines right up to the edge, they need to extend beyond the finished card size by 3mm on each side. When sheets of paper pass through a printer, there is a chance that the image printed onto each one could be in a slightly different position. If you have a stack of sheets to be cut into, say, business cards or A5 leaflets then the bleed covers for this shifting and means you don’t get any white bits around the edges. You also should ensure that nothing important is too close to the edge as it might get trimmed. Whatever software you use, always check that the bleed is in the PDF as this will save time later. Files for printing need to be a much higher resolution than what you might see on a computer screen, otherwise text might not look very sharp when printed. If possible, save your artwork as a PDF file from the original software* as this should then print the text and some graphics at the maximum resolution of the printer. 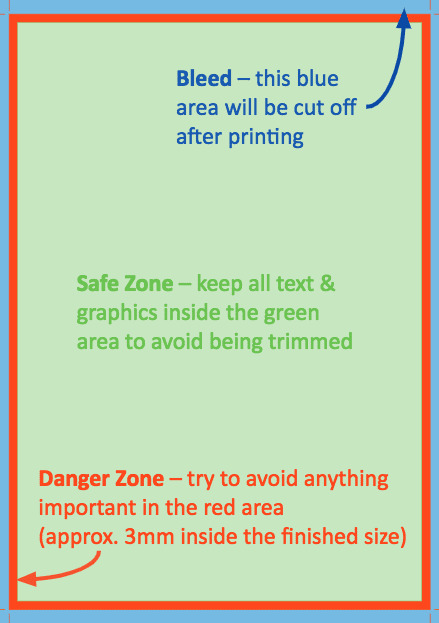 This is particularly important with business cards where the text is often small. *Converting from a bitmap graphic such as JPEG or TIFF to a PDF won’t improve it – it’s best to save as PDF from the original software if possible. If you use Photoshop to create a file with text, keep it in layers i.e. do not flatten or merge the layers, and Save As a Photoshop PDF. The text will then print at the resolution of the printer. If you have low resolution graphics such as small pictures from websites then they are unlikely to look very good unless you make them smaller. Bear in mind that these are recommended minimums so if you have a larger size in pixels, then it could look better. If you take a small file and print it larger then the effective resolution is reduced. For example, scaling up A6 to A4 halves the resolution. If your file is lower resolution than we recommend and you cannot make a better version then it might still be acceptable to you; ask for a test print. Low resolution can still be legible – just not as good as it could be. For larger prints such as A2/A1/A0 posters, people tend not to look at these so closely so you can get away with a lower resolution e.g. 200 pixels per inch. However, if you have small text, you may want a higher resolution than this. Again, if you can save in PDF from the original software this is likely to give the best results anyway.